Its simple, We leave nothing up to chance... Why should you? Second of all look at these faces.. Can you find any cuter? You have come to the right place to learn all about the Shorkie breed. .
My name is Stefanie Bailey( everyone calls me Steffy). I started the Shorkie breed 24yrs ago and am the founder of the Shorkie Club of America and I only breed Shorkie puppies. All of our Dogs are genetically screened prior to every breeding to produce healthy puppies. We have compiled and interesting list of reasons that most customers select us on the basis of our experience, commitment, passion for the Shorkie breed and more. We pride ourselves on the specific needs of each family and are the experts in matching your family with a Shorkie that is right for you. Your satisfaction is our priority. potential puppy parents that looking for a new FURRY additon to their family, we offer a free consultation which gives you the opportunity to discuss the type of puppy you are looking for, your concerns in adopting from a reputable breeder and to help you to understand how we are so successful in our approach to our breeding practices. Some of the obvious reasons like our dedication to our puppy parents and Shorkie references that for on for more than 2 decades. Our Money Back Guarantee, Life Time health warranty, Free shipping and safe travel guarantee, Life time take back policy all covered in our Buyers Protection Policy speak for themselves. But below we have broken it down for you ever further. The #1 one reason besides starting being responsible for the Shorkie breed here in the USA 24 yrs ago .. People respect the fact that WE ONLY BREED SHORKIES. We do not divide our attention amongst other breeds and are solely focused on the betterment of the Shorkie breed. This allows us to keep our focus so our clients receive the BEST OF THE BEST! On occasion we will have a purebred litter of Shih Tzu and or Yorkies to keep our lines back for future breeding but we have to do this to continue the Shorkie breed and out cross lines ,prevent inbreeding and continue developing the Shorkie breed. Our education process for our clinets is one of kind. Each of our puppy parents receives a copy of The Official Shorkie Guide written by me. This is the only book written about Shorkie puppies and is also a DOG 101 for those who have never owned a dog before. This will help you prepare for your puppy and educate you all about the breed. Sometimes we all need someone to talk too! That is what I am here for. Getting a new puppy is a huge undertaking and the last thing you want to feel like is that you have been abandoned once you get your puppy home. We cherish each relationship we have established and continue to nurture it with our Priceless Pups families long after our puppy arrives home. When people adopt a Priceless Pup, they know they have the my personal support 24 hours a day 7 days a week. . Despite the amount of Priceless Pups families all over the world growing in leaps and bounds and all the new potential clients that contact me I managed to establish a distinct identity that separates Priceless Pups from any other website or breeders on the internet today by getting to know each and everyone one a personal level.. WE ALWAYS TAKE TIME FOR YOU IN OUR DAY! Each and every family gets my attention when they need me. You will always here back from us within 24 hours. If you dont I did not get your message. 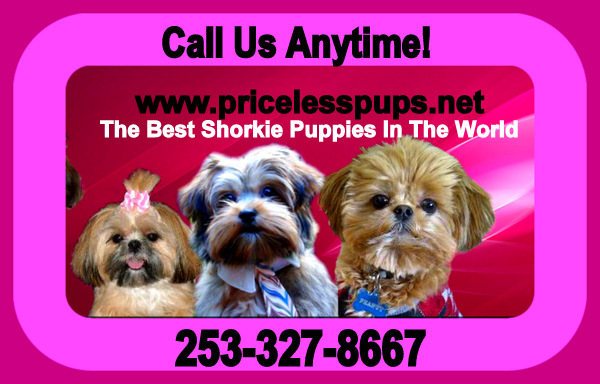 Whether you are new to Priceless Pups or a repeat customer. We are here to answer all your questions and council you through this journey of adopting a new family member. Often when a puppy comes home that is when all the questions begin. CALL ME ANYTIME! that is what I am here for. My expertise is a gift that I love to share . Sometimes families just need to know they are doing things right and all that is needed is a little moral support. That is what I am here for. Our Shorkie Puppies have the "Look"
It is true we do have the "Look" that everyone is wanting in their dogs but our puppies also have the healthy genetics and sound temperaments too! We have been working for 24 plus years to produce dogs that are perfect in conformation, and stay true to all of the qualities that make this such the Shorkie an exceptional breed. This means producing beautiful puppies from TOP KNOTCH ADULTS that come from lineages that are proven to have sound temperaments, breath taking beauty, and long lines of genetic testing behind them. Producing dogs of this exceptional caliber and placing them in ideal homes takes a tremendous amount of energy, effort, expense, and time, but we would have it no other way. Our dogs are in our house at all times and we do not have a DOG AREA! they sleep in our beds and we do not have a breeding facility. They are members of our family. Our puppies are raised the same way. We start training our puppies Priceless Pups kindergarten class.. We want you to have the least stressful transition with your new companion as possible. So we do much of the work here for you. All of this means that when you finally do bring home your Priceless Pup you can be assured that you have selected a Shorkie of the utmost quality that will give you a lifetime of devotion. It is easy to be anyone on the internet these days. Put up a website and there you go. We have developed an entire page so you can meet us and everyone that is involved in your puppies life. From me to my children to my vets, vet techs, groomer, trainer, and even the people involved in shipping your puppy home to you. You get to meet the entire Priceless Pups Team! If you have not visited the MEET THE TEAM PAGE on our site please do so. We offer this page to give you a good idea of who we are and how important all the people in our puppies lives are.